a local store near me has been using sprites from dragcave as their logo and on their marketing. I have told them several times they belong to this site but they continue to say it’s not my business and they like the art. How do I report them? Their arrogance towards art theft I admit has struck a cord with me, but as an artist myself I can’t just let them use stolen art. That's a bit blatant. I'd suggest you PM TJ with the link. PM the artist as well, Slivanon. I'm sure she would like to know that her sprite is being used on another site, even if she is now inactive. I am letting TJ know. In the preview of one of the videos you can see them on a printed banner (I didn't watch the video), and they are used on the site's Facebook page, as well. Yeah, they are using the Reds on all of their social media sites it looks like. Hi Cathy thank you for reaching out to us. We actually have permission from the artist to use them as our logo. This was brought to our attention almost 2 years ago and so we reached out to Silvanon at that time. Dunno if they permission from TJ though, so I'd still ask. Yeah...isn’t there some contract that has to be signed that the sprites on DC can only be used here in DC? I don't think that was in effect then. For some reason, I doubt that they have permission from the artist, and I'm sure they don't have permission from TJ. Even though the artist agreement wasn't there back in the day when the sprites were released, the "almost 2 years ago" has me doubt they could still use Red dragon for marketing. In the end, the agreement must have been signed much earlier, even if this has been after-thought. The Artist Agreement doesn't in the end have specific dates (at least blank version doesn't) about when the dragon has been released, just that DC owns the rights to it when it happens (or in this case, has happened). Red is more or less released, even if the agreement has been signed later. Though I have strong doubts Silvanon just giving permission to them. Either way, I can see four things happening here personally. 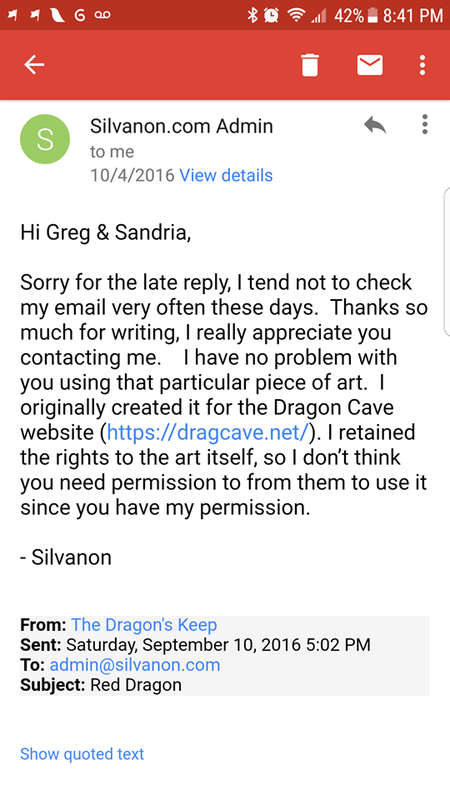 1) If Silvanon never signed the Artist Agreement, technically DC doesn't own the sprite and it could be used anywhere with just Silvanon's permission. 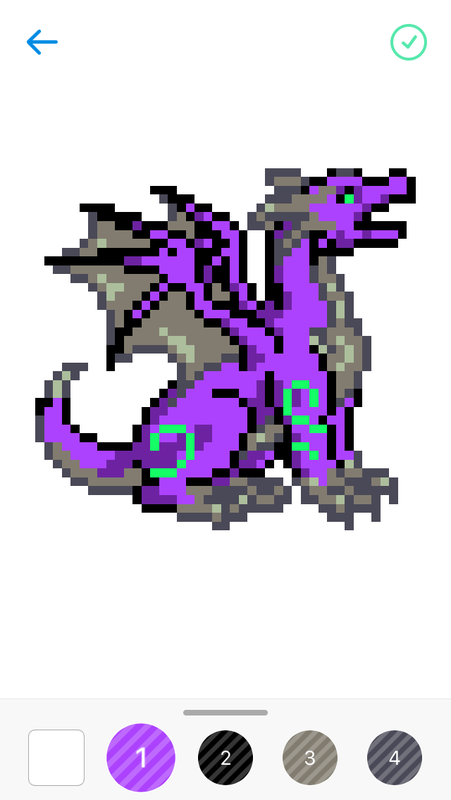 Though DC can in this outcome continue to have the Red dragon sprite or just replace it with more unique sprite. 2) If Silvanon really has given permission to The Dragon's Keep to use the sprite for marketing after signing the agreement (like they are claiming), it could be seen as violation of agreement and Red gets just removed along with some other sprites that Silvanon worked on. A lot of replacements would then be in order. 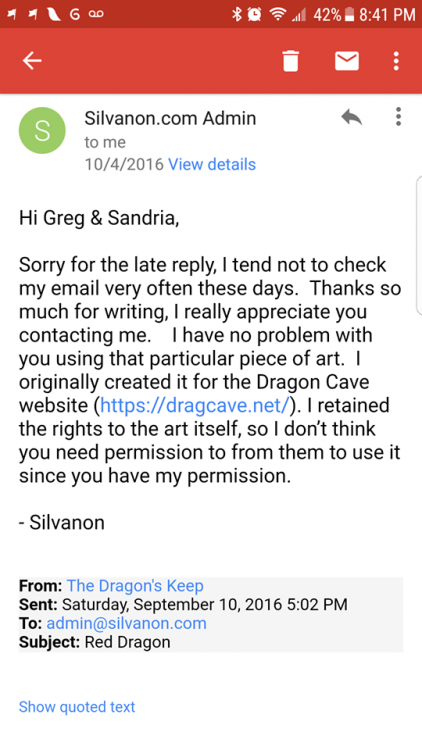 3) If no permission was obtained from Silvanon, The Dragon's Keep gets DMCA notice should TJ decide to do so, which could lead to them having to do a lot of changes to their marketing. Unless they want to be idiots and go into court with this obvious case. 4) Silvanon's sprite just gets replaced quietly with much needed updated version and there won't be any huge fusses aside the DC community again screaming and screeching about losing yet another classic sprite. I think that if the new spriter was as careful with Reds as Odeen was with Splits, we'll be ok without much drama. The Splits look...... Spectacular, and went with hardly a murmur. But yea, I think you summed it up. And I'll almost guarantee that Silvanon signed some sort of artist agreement (though probably the old one): her more recent offerings are Cheese, Ice, and Horse dragons. I'm tagging her just in case. 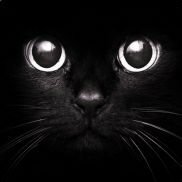 @Silvanon Don't know if she has a DA account or anything, can someone contact her off-forum? 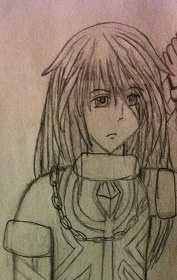 Well, Here is her DeviantArt, but I can’t contact her through it as I don’t have an account. She hasn't logged in there in over four months, so I'm not sure she can be reached there now. I don't think the spriter allowed them use Red sprite. I found a facebook profile for somebody named Cami Mckune. I think it's her, but I just messaged them to make sure. If it is her, I'll tell her about what we've found. Her posts seem to be a bit far apart though, her previous was in January and before that, November of last year, so idk if contacting her will be that easy. So this isn’t a question about the site per se, but I have this app called Sandbox that’s a paint-by-number pixel art thing. So I picked a little dragon and the more of it I colored in, the more I recognized it. I was like “hey that looks pretty familiar. Is that a... royal blue hatchling?” And sort of disregarded it because the coloring was different but I looked it up today and it is almost an EXACT replica of the royal blue s2 hatchling, just flipped and recolored. is this even legal? If not, how do I report it? Less perhaps, more definitely. Businesses like these take advantage of the fact that most artists are so small-scale that they cannot afford legal action. And yes, I strongly doubt they actually got permission. I messaged them on Facebook (mostly because I was mad, Ive been watching way to many "art theft rant" YouTube videos) and told them the community was mad and wanted proof if they were telling the truth. They sent me this. I'm not sure if, if this is real, they still needed TJ's permission on the basis that they make a profit on it. But yeah, here is what they've got. There is an astonishingly widespread assumption that if it's online, it's freely available to anyone who sees it. Sadly, I've even heard of cases of this attitude in people who should absolutely know better. Maybe it's just that I've dealt with (and seen friends deal with) enough art theft to last me a lifetime, but I feel like you're being too generous. Most of what I've seen is people backpedaling to ignorance when called out, and then escalating to "well you should have watermarked it/shouldn't have put it online if you didn't want people using it!" when pressured about removing the art. I didn't think I was being that generous! I think things like Pinterest have made it a lot worse too. I personally hate the "don't put it online then!" attitude - I do a bit of quilting and the only way to interact with the wider quilting community is to.... put things online. Copyright and IP protection are pretty hot topics in the quilting world - although there's a lot of confusion and fuss over how it all works.